The demand in the global market for form-fill-seal machines is projected to multiply at a CAGR of 5.7% during the forecast period of 2017 to 2025, gaining traction from its versatility to be customized according to the requirements of diverse end-use industries, capability to operate under reduced floor space, and option to operate under contamination-free environment. The prosperity of the food and beverages industry is also providing strong traction to this market. On the other hand, their inability to cater to low-volume production processes is obstructing the prosperity of global form-fill-seal machines market. Based on packaging type, the global form-fill-seal machines market has been segmented into bags & pouches, cups & trays, bottles and ampoules, blisters and other kinds of packaging like squeezable tubes. In 2017, the bags & pouches packaging segment accounted 43.1% of the overall demand, and is expected to sustain their demand share due to continued preference for flexible packaging in the food packaging industry. Bags & pouches that are made of high quality flexible film materials and offer premium print quality will continue to dominate the market over the forecast period, 2017-2025. On the other hand, investments in manufacturing machines for blisters and bottles & ampoules packaging with aseptic technology are expected to be emerge as key growth aspect of the market, particularly driven by the growing requirement from the pharmaceutical and consumer goods industries. On the basis of machine type, the global form-fill-seals market has been categorized into vertical and horizontal machines. Presently, the demand is dominated by vertical form-fill-seal machines, due to its affordable price range, low consumption of machine shop floor, and productive performance in flexible packaging. That being said, horizontal form-fill-seal machines are capable of thermoformed packaging like cups, trays, blisters and others. Blow-fill-seal machines are one kind of horizontal form-fill-seal machines capable of forming plastics bottles for the non-alcoholic beverage industry and also vials & ampoules for pharmaceutical industry. The food industry, which is the most profitable end-user, is further classified into dairy, frozen & chilled food, ready meals, snack bars, bakery & confectionary and other. The food industry is estimated to contribute with the maximum share of about 45% in global form-fill-seal machines market by the end of the forecast period. Snack bars is the food sub-segment expected to experience most prominent growth rate. Geographically, the global form-fill-seal machines market has been bifurcated into North America, Latin America, Europe, Middles East and Africa (MEA) and Asia Pacific (APAC). In 2017, Asia Pacific accounted for 40.6% of the demand out of the overall market, and is anticipated to remain as the most lucrative region throughout the forecast period. The driver for this strong demand from APAC is low cost machinery with high specifications and quality of production. Another reason of growing demand of form-fill-seal machines in Asia Pacific is the changing lifestyle of the urban population. This region houses some of the most populated emerging economies, and rapid urbanization is prospering the packaged food and beverage industry. Europe is another highly profitable regional market for the vendors operating in the form-fill-seal machines market. Europe is amongst the major producers of packaging machines and thus full-filling the requirements of form-fill-seal machines in the region as well as other regions. Robert Bosch GmbH currently holds the pole position in a fragmented competitive landscape of the global form-fill-seal machines market. Some of the other notable players are: Matrix Packaging Machinery LLC, Uflex Ltd., Hayssen Flexible Systems Inc., IMA Industria Macchine Automatiche SpA, Tokyo Automatic Machinery Works Ltd., Mespack SL, Ossid LLC, Webster Griffin Ltd., Bossar Packaging SA, Nichrome India Ltd., Velteko S.R.O., Omori Machinery Co. Ltd., All-Fill Inc., Sacmi Filling SpA, Arpac LLC, and Fuji Machinery Co., Ltd.
Transparency Market Research examines the global form-fill-seal machines market for the forecast period 2017-2025. The primary objective of the report is to identify opportunities in the market and present updates as well as insights pertaining to various segments of the global form-fill-seal machines market. 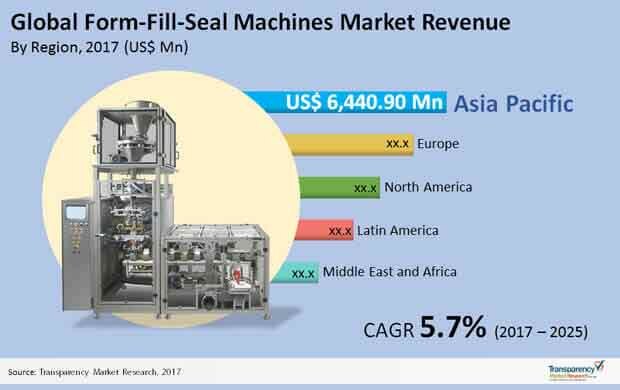 The report begins with an overview of the global form-fill-seal machines market, evaluating market performance in terms of revenue, followed by TMR’s analysis of key trends, drivers, and restraints witnessed in the global market. Impact analysis of the key growth drivers and restraints based on the weighted average model is also included in the report. To compute the market size, in-depth secondary research is done. Data points such as regional splits and market split by machine type, and packaging type has been assimilated to arrive at appropriate market estimates. The report comprises the forecast of the global revenue generated by the sales of form-fill-seal machines market. TMR triangulates the data via different analysis based on supply side, demand side as well as the dynamics of form-fill-seal machines market. TMR not only conducts forecasts in terms of value, but also evaluate the market on the basis of essential parameters, such as Year-on-Year (Y-o-Y) growth. This helps providers to recognize the future opportunities as well predictability of the market. Vital feature of this report is the analysis of the form-fill-seal machines market by region, packaging type, machine type and end-use industry; and the corresponding revenue forecast in terms of incremental dollar opportunity. This is traditionally overlooked while forecasting the market. However, incremental dollar opportunity is critical in assessing the level of opportunity that a provider can look to achieve as well as to identify potential resources from sales perspective of the global form-fill-seal machines market. To understand key segments in terms of their growth and performance in the form-fill-seal machines market, Transparency Market Research has developed a market attractiveness index. The resulting index should help providers identify existing market opportunities in the global form-fill-seal machines market. In the final section of the report, form-fill-seal machines market competitive landscape is included to provide a dashboard view of companies that manufacture form-fill-seal machines. The report contains company profiles of some of the players in the global form-fill-seal machines market. Some of the players operating in the global form-fill-seal machines market include Tokyo Automatic Machinery Works Ltd., Uflex Ltd., IMA Industria Macchine Automatiche SpA, Hayssen Flexible Systems Inc., Robert Bosch GmbH, Matrix Packaging Machinery LLC, Bossar Packaging SA, Ossid LLC, Nichrome India Ltd., Omori Machinery Co. Ltd., All-Fill Inc., Velteko S.R.O., Sacmi Filling SpA, Arpac LLC, Fuji Machinery Co., Ltd., Webster Griffin Ltd., Pakona Engineers Pvt Ltd., Mespack SL, Turpack makine sanayi ve Ticaret Ltd. Sti. And Fres-co System USA, Inc.